Oh my gosh, this week’s stream of consciousness prompt is “mon” and all I can hear is some voice saying “Hey, mon!” in a Jamaican accent in my head. How am I supposed to work like this? I cannot write like this. Get out get out get out. I refuse to write about Mondays. I mean, I don’t have anything against Mondays, I just don’t really have anything to say about them. Not anything you’d find interesting anyway. Wow, we’re off to a great start. I’ve managed to get bread back in the house (gotta hate when you come back from vacation to find a moldy loaf sitting in the bread bowl), so the kids are on their sugar/cinnamon toast kick. Don’t get me wrong, I love me some sugar/cinnamon toast, but when I say they’re on a kick I mean they can go through an entire loaf in three days. We believe in carb loading around these parts. Thank my lucky stars, it looks like we’ve moved back out of the monogramming phase that hit so hard in elementary school. Shirts, bags, water bottles, notebooks, sweatshirts – if you could hold it still, Bear wanted to smack a monogram on it. Never quite caught the fever myself. Monkeys! Who doesn’t love monkeys?! That seems like one of the best darn mon- words out there, if you ask me. Which reminds me. I follow an Instagram group called animalonearth and they posted this video of someone helping a sloth cross the road. (No, this isn’t like the chicken joke. There was an actual sloth trying to cross an actual road at a glacial pace.) So many thoughts went through my head as the guy reached slowly (bwahahaha!) for the sloth, thoughts like “I wonder if I’m about to see a guy mauled by the sloth he was trying to help?” I didn’t. At any rate, are you on Instagram? You should totally follow this group. No, that paragraph didn’t have anything to do with a “mon” word. That’s where the stream of consciousness comes in. Mormon has an mon though. You know we saw two Jehovah’s Witness Kingdom Halls on Kona? No, that has nothing to do with mormons, it just jumped in my head. BrightSide and I did go to see Book of Mormon recently(ish) and WOO BOY, that play’s gonna be a surprise if you don’t know what it’s about ahead of time. 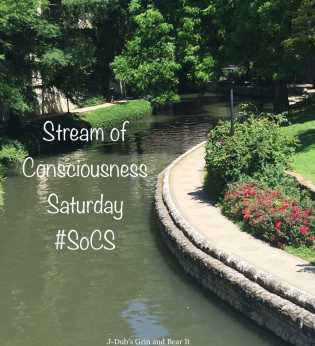 Linda’s stream of consciousness prompt for Saturdays is sheer delight. Click on over and check out her blog. Moo has pretty serious phases of cinnamon toast, too! I agree, it’s good, but not eat-my-weight in it good! I enjoyed this post. I never got past the Jamaican greeting for mine. Sometimes it just gets full on stuck, doesn’t it? Nicely done – from toast to Mormons, and who doesn’t love a good sloth video. ☺️ It was my first one…who knew sloths could be so entertaining? Well, except for in Zootopia. My daughter loves the sloth that is at the National Aviary in Pittsburgh. She has a video of it walking from one end of its tree to the other. It’s so slow it’s comical.